Pfc. 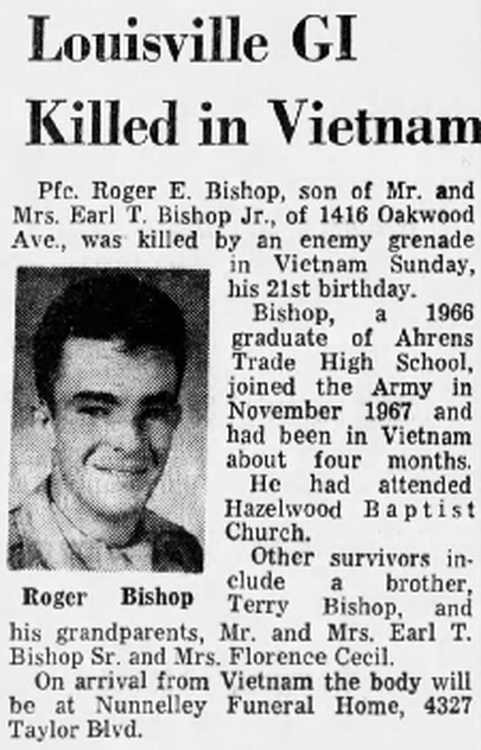 Roger E. Bishop, son of Mr. and Mrs. Earl T. Bishop Jr., of 1416 Oakwood Ave., was killed by an enemy grenade in Vietnam hunday, his 21st birthday. Bishop, a 1966 graduate of Ahrens Trade High School, joined the Army in November 1967 and had been in Vietnam about four months. He had attended Hazelwood Baptist Church. Other survivors include a brother, Terry Bishop and his grandparents, Mr. and Mrs. Earl T. Bishop Sr. and Mrs. Florence Cecil. On arrival from Vietnam the body will be at Nunnelley Funeral Home, 4327 Taylor Blvd. The funeral for Cpl. Roger Earl Bishop will be at 9:30 a.m. Saturday at SS. Simon & Judo Catholic Church, 4335 Hazelwood, with burial in Resthaven Memorial Park. Cpl. 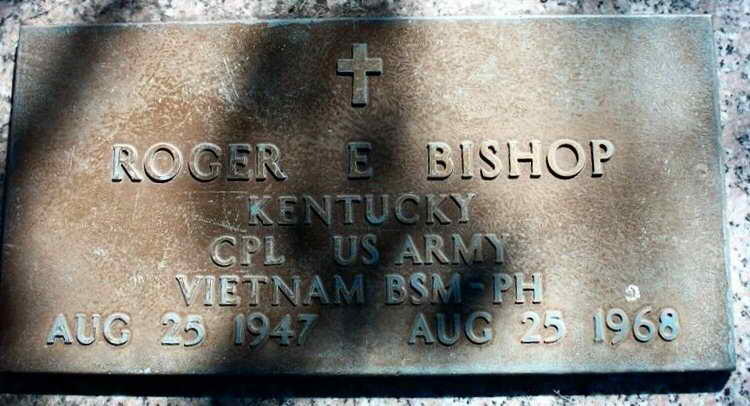 Bishop, 21, was killed in action in Vietnam August 25. 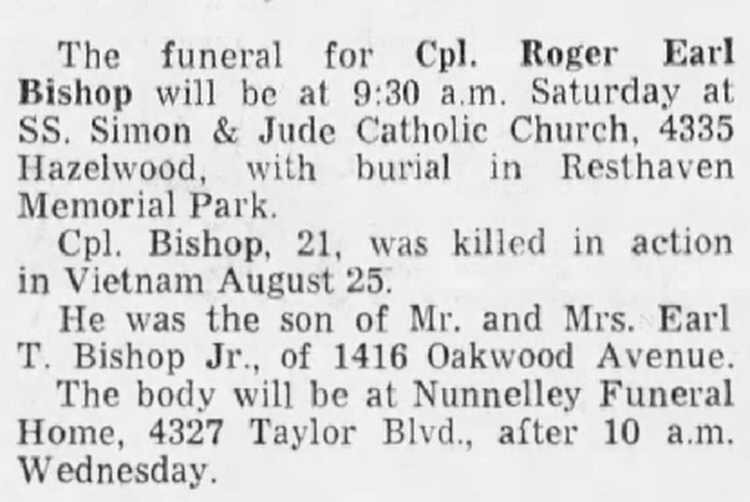 He was the son of Mr. and Mrs. Earl T. Bishop Jr., of 1416 Oakwood Avenue. The body will be at Nunnelley Funeral Home, 4327 Taylor Blvd., after 10 a.m. Wednesday. Grave marker for Cpl Roger E, Bishop in Section 15, Lot 350, The Garden of Faith, Resthaven Memorial Cemetery, Louisville (Jefferson county), Kentucky. Cpl Bishop was a member of B Company, 1st Battalion, 508th PIR. He was killed in Thua Thien, South Vietnam, by a grenade.